The complete schedule has now been released for the 2009 Aussie Millions tournament series. The series will start on January 4th, 2009 and run through January 26th. Preceding the series itself will be five days of satellites and non-championship tournaments. The AUD $10,500 main event, once won by Gus Hansen and whose 2008 champion was Alexander Kostrisyn, will begin on January 19th, and is scheduled to have three starting days and run for an entire week. There are many exciting tournaments scheduled in addition to the main event. Among the 18 scheduled events are the AUD $10,000 HORSE event and a AUD $100,000 high roller event. 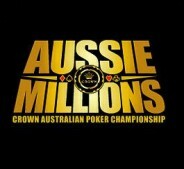 For a more detailed schedule of events you can visit the Aussie Millions website at www.aussiemillions.com/schedule.